Recap: U.S. economic growth remained unspectacular, expanding a mere 1.4 percent in Q2, year over year. A strong U.S. consumer has been driving what little growth did exist. Although the U.S. outperformed many advanced economies, output remained well below its long-term average, even as the labor market was close to full employment. Personal consumption increased 4.4 percent in Q2, but against the backdrop of lackluster global growth, drags from net exports continued to serve as a headwind. While inflation in the broader economy remained subdued, it has edged closer to the Federal Reserve’s target of 2 percent. The PCE deflator, the Fed’s preferred measure of inflation, was up 1.0 percent on a year-over-year basis, displaying weakness that could partially be attributed to the collapse in energy prices. However, stronger readings on core PCE inflation, now running at a 1.7 percent pace, should give the Fed confidence that headline inflation could pick up over the medium term. Despite unimpressive global growth, slowing global trade patterns, and policy easing among major central banks, the Fed has stayed committed to its gradual path of higher rates, a path that has proven to be responsive to incoming economic data. The Fed would appear ready to hike rates at its December meeting. Cautious consumers, retrenching manufacturers, and scant signs of inflation have diminished optimism about a breakout in economic growth in the final stretch of the year. The economy could be constrained for the rest of the year to a growth rate only slightly above the expansion’s overall 2% pace—the weakest of any since the 1940s. Consumer Confidence: U.S. consumer confidence in September rose to 104.1, up from 101.8 in August, the highest level in nine years and a hopeful sign for economic growth. It appeared that steady job gains, low volatility in equity markets and subdued gasoline price pressures helped consumers’ outlooks. Their views about current economic conditions and expectations about future economic conditions rose in this month’s survey, a development which should help boost consumer spending and the overall economy in the coming holiday laden season. Personal Income: Personal income rose 0.2% in August while personal consumption remained flat. Weakness in spending volumes was concentrated in durable goods, which came off a sizeable jump up in July. Personal spending was up slightly in July, but it was due to prices as real spending growth remained the same. Headline inflation remained unchanged in August, from an upwardly revised 1.0% (year/year) in July. Core PCE inflation ticked up slightly to 1.7% year/year (from 1.6%). Flat spending in August, relative to rising income, meant the personal savings rate increased to 5.7%. Durable Goods and Business Spending: U.S. factories reported flat demand for big-ticket goods in August, suggesting the economy continued to be restrained by sluggish business spending. Orders for durable goods—products such as cars, tractors and refrigerators designed to last longer than three years—were unchanged from a month earlier. When excluding the volatile categories of defense and transportation products, sales declined. Demand for durable goods—a key measure of the economy’s underlying health—has been choppy of late. Orders rose sharply in July after falling precipitously in June. Through eight months of 2016, orders were down 0.6% compared with the same period a year earlier. Much of the weakness was tied to woes in the energy industry, with the oil and coal industries pulling back investment, though demand remained broadly sluggish. The report offered at least one encouraging sign: companies modestly stepped up spending on equipment and facilities in recent months, a development that, if sustained, could lift the economy to stronger growth. 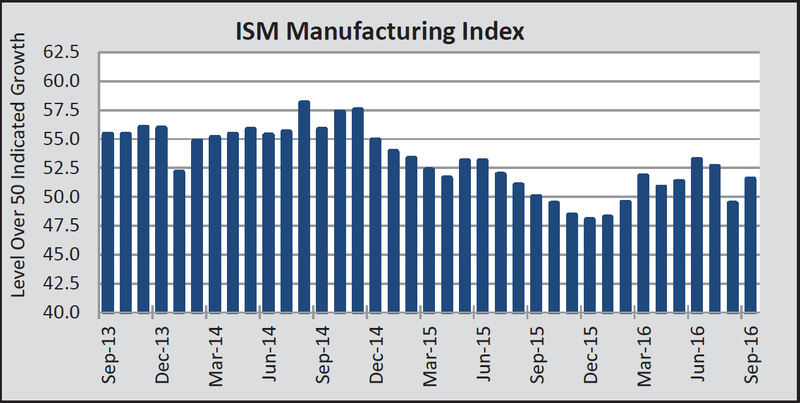 The data has remained consistent with a weak manufacturing sector, but not necessarily weakening. Weak business spending has been a major factor behind the economy’s subpar growth in recent years. Some of the weakness has been tied to depressed energy prices, which have led to a decline in drilling and exploration, but the weakness in investment spending has extended beyond that sector. Housing: Sales of newly built homes declined 7.6% in August after surging the prior month, though the broader trend showed solid momentum in the market for single-family houses. It was the largest one-month drop since September 2015. More broadly, through the first eight months of 2016, new-home sales were up 13.3% compared with the same period in 2015. New-home sales have accounted for a fairly small slice of U.S. home buying activity, and short-term fluctuations have obscured the underlying trends. 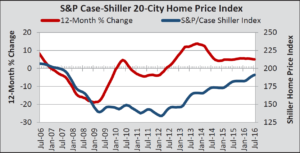 The U.S. housing market has appeared to slow in recent months, despite continued low borrowing costs. Sales of previously owned homes slipped in August for the second straight month, squeezed by tight inventory and higher prices. Also, residential building permits and housing starts both fell in August from the prior month. 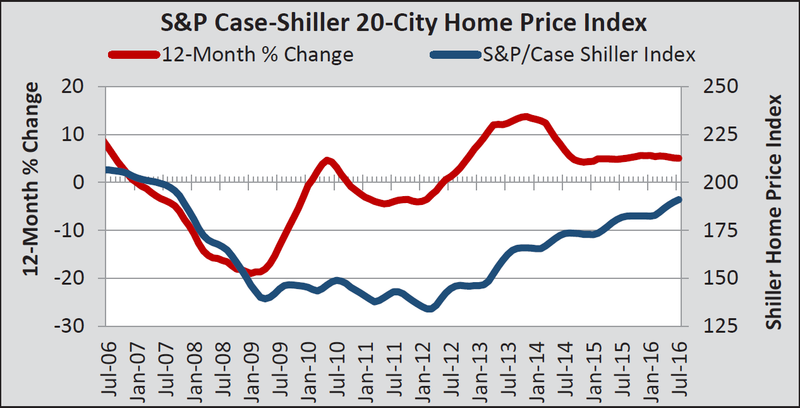 Weakness in the multifamily sector has disguised strength this year in single-family home construction. Demand for new homes has been robust and the supply has not adequately kept up, which has been a primary theme in the housing sector for quite a while now. Labor Market: U.S. employers did just enough hiring in August to keep unemployment in check and maintain steady—though unspectacular—wage growth. But cooling job growth from recent months reinforced the expectations that the Federal Reserve would push off a rate increase until December at the earliest. The monthly gain of 151,000 jobs was neither strong enough nor weak enough to settle the central bank’s long-running dilemma about whether the labor market could withstand another interest-rate increase. The unemployment rate was unchanged from the prior month at 4.9%. The August job gain marked a slowdown from the more than 270,000 jobs added in each of the prior two months. Moderating growth has long been expected as the economy nears full employment and employers need to add fewer jobs to absorb new entrants into the labor pool. Non-Manufacturing Index: In August, there was an unexpectedly large drop in the ISM non-manufacturing index, which had fallen to its lowest level in six years, led by sharp declines in business activity, new orders, and pullback in the employment subcomponent. The report was all the more somber given that it came shortly after its manufacturing counterpart had slipped into contractionary territory. While the manufacturing weakness was not new, the slowdown in the service sector activity threw cold water on the notion of an overheating U.S. economy. The Federal Reserve: The Federal Reserve left short-term interest rates unchanged in their September meeting but signaled it expected to raise them before year-end. The Fed offered an upbeat assessment of the economic outlook, noting that growth had picked up after a dismal first half, with household incomes growing solidly and workers rejoining the labor force in search of jobs after years of not looking. Still, the Fed was in no hurry to raise rates to cool the economy because inflation remained below the Fed’s 2% target and a growing pool of available labor was preventing wage pressures from building. Tapering the path of interest-rate moves was a sign of “resignation” that there would likely not be a major surge in growth in the near future. The Fed’s stance underscored the lack of urgency the U.S. central bank’s leadership has felt about lifting rates. Fed officials had grown concerned earlier in the year about a range of global problems, including Britain’s decision to exit from the European Union and China’s uncertain economic outlook. It would appear the Fed now feels risks have become “roughly balanced,” meaning the economy has just as good a chance of exceeding the Fed’s growth estimates, as of falling short. That risk assessment could serve as a clue about whether the Fed expects to move rates in the months ahead. When officials see risks that worry them, they aren’t inclined to move rates up. The Fed’s next policy meeting, Nov. 1-2, will fall a week before the presidential election, and action is unlikely then, leaving a mid-December policy meeting as the Fed’s last scheduled chance this year to push rates higher. Eurozone: Economic growth in the Eurozone remained subdued on a year-over-year basis in Q2, expanding 1.6 percent, the same rate as Q1. Construction remained weak and retail sales growth decelerated year over year from mid-2015. Lackluster domestic demand and uncertainly surrounding the U.K.’s decision to leave the EU reinforced the view that the Eurozone economy was not set to “break out” any time soon. CPI inflation continued to stagnate, slowly emerging from negative territory on a year-over-year basis in recent months. Even with the volatile components of energy and food removed, the core rate of inflation remained at less than 1.0 percent, well below the ECB’s target. With growth and inflation trends subdued, and confidence surveys muted, disinflationary pressures should persist. The unemployment rate had been slowly edging downward; however, with a rate currently at 10.1 percent, the Eurozone has a long way to go to reach prerecession employment levels. In the wake of Brexit, the ECB held off from adjusting its monetary policy, and while further easing remained a possibility, it did not appear imminent. The euro is expected to soften against the U.S. dollar in the coming quarters, especially as a 2016 Fed rate hike becomes increasingly likely. United Kingdom: On the surface, the United Kingdom appeared to have emerged from Brexit without suffering a detrimental economic setback. 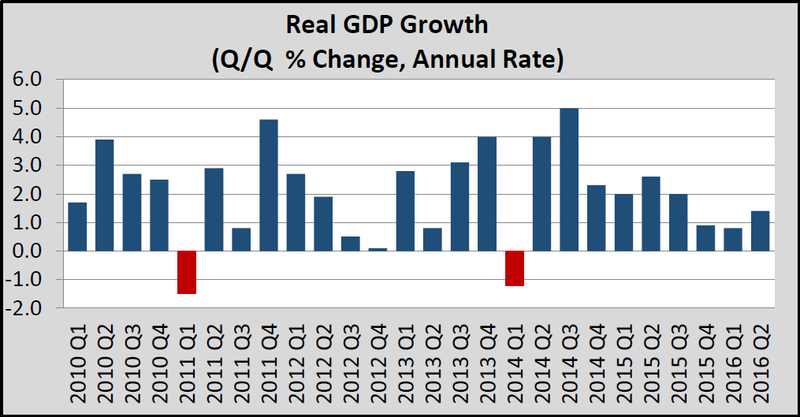 Real GDP grew 0.6 percent (not annualized) on a sequential basis in the second quarter. However, the economic outlook has deteriorated significantly since voters decided to leave the EU in the June 23rd referendum. Uncertainty surrounding the timing of the exit, as well as the future of their trade agreements and immigration rules, will continue to discourage investment spending in the U.K. In response to this deteriorating outlook, the Bank of England (BoE) has cut its benchmark policy rate by 25 bps to 0.25 percent from 0.50 percent. The BoE had expanded the size of its government bond buying program, which now included corporate bonds. The British pound, which had been under enduring pressure since the referendum result and subsequent policy rate cut, had plunged over 10 percent against the dollar. Continued accommodative monetary policy should lift the overall CPI inflation rate, at least in the near term, due to higher prices of imported goods. The British economy may well be slipping into a modest recession. Real GDP in the U.K. could fall slightly more than 1 percent on a peak-to-trough basis over the next three quarters as a result of a sharp pullback in investment spending. Japan: The Bank of Japan (BoJ) had surprised many investors by adopting a couple of policy measures that were previously thought of as too radical by the bank. The first, referred to as yield curve control, aimed to target the interest rate on the longer end of the curve at zero. The BoJ had essentially announced it would buy any 10-year Japanese government bond should their price fall to that level. Secondly, the Bank pledged to let inflation overshoot the target – effectively committing to be slightly irresponsible. The BoJ also tweaked its QE allocation, aiming to buy more short-term debt to help steepen the yield curve and reweighing ETF purchases towards the domestic oriented Topix index away from the export-heavy Nikkei. The BoJ did not lower interest rates, suggesting that such a move remained a “possible option for additional easing.” Lack of a cut fanned the view that the BoJ could be running out of ammo, which together with fears that these moves were too late, has thrown into question the efficacy of the new measures. The Bank has failed to fend off the deflationary mindset for years, with the pledge to overshoot only helpful if the target could be reached in the first place. China: Real GDP grew 6.7 percent in the second quarter on a year-over-year basis, unchanged from Q1. Growth in the “secondary” sector, which combined the industrial and construction sectors, strengthened to 6.1 percent from 5.8 percent. The recent stability in the industrial sector would appear to reflect renewed strength in Chinese exports. Moreover, consumer spending would seem to have remained resilient as growth in nominal retail spending stayed above 10 percent in the second quarter. That said, growth in overall investment spending appeared to have slowed further. Despite the equity market collapse last fall, the economy seemed to have achieved a soft landing. Supercharged, double-digit economic growth rates are not likely in the foreseeable future due to continued deceleration in investment spending in China. Relative stability in the exchange rate and in the level of foreign exchange reserves in recent months would suggest that the surge of capital outflows that occurred last year have slowed. Going forward, however, the long-run outlook for the Chinese economy could be a concern. Structural issues, such as the Chinese government’s willingness to keep struggling state-owned enterprises afloat have the potential to weigh on productivity while misallocating capital to less dynamic firms. Chinese economic growth should continue to slow over time. Outlook: The U.S. economy has continued to add jobs at a steady clip, with a hiring streak that surpassed its previous record in March and is now at 70 straight months. The unemployment rate is below 5%, gas prices have fallen below $2.50 a gallon and home prices have recovered to last decade’s levels. Median household incomes rose 5% in 2015 leaving them 1.6% below the 2007 level, before the last recession struck. 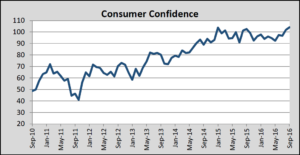 Gauges of consumer confidence have generally shown solid readings, a sign American households are emerging from the recession’s long shadow and should continue to support U.S. economic growth. The US household for the moment is in the driver’s seat, providing what growth does exist in the economy. An acceleration in the economy starting in the summer after nine months of economic growth around a 1% rate was expected. The uptick was expected to deliver firmer wage growth and price gains, and put Federal Reserve policy makers in a position to lift the central bank’s benchmark interest rate by this month. But economic growth, in the U.S. and abroad, has been sluggish since the last recession ended in 2009, with global central banks holding rates near zero to boost borrowing and consumption; this has been a familiar story for the U.S. economy since the recession ended in mid-2009. Signs of gathering strength have often failed to yield a sustained acceleration in the expansion. 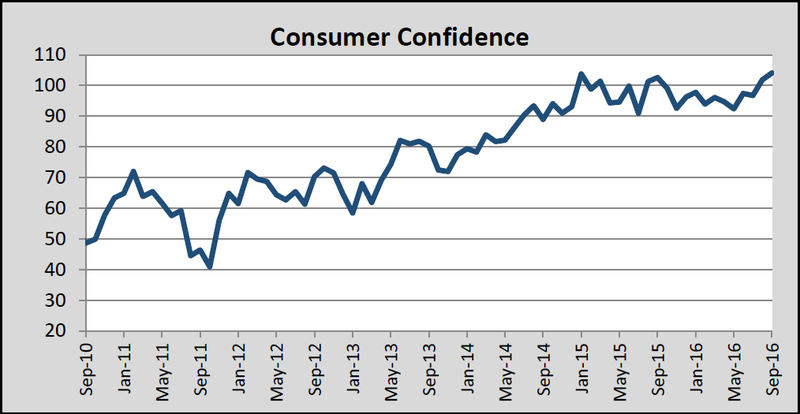 Consumers have grown more cautious ahead of November’s election. This has left the data dependent Fed with less incentive to raise rates. This trend is likely to continue with yield hungry investors being forced to take on more risk to achieve their income needs for today’s consumption. This condition remains a downside risk to those investors and savers. Recap: US equity markets posted their best quarter of the year, marked by a decisive push in July as global markets shook off post-Brexit anxiety. August and September were generally less dramatic from a performance perspective, but still kept investors on their toes as macro headlines continued to influence day-to-day market movements. The broad central bank theme of easy monetary policy seemed to win the day, feeding a “risk-on” mentality that benefited areas like small-cap stocks, high yield bonds, and emerging markets altogether. The second half of 2016 continued to see bouts of market volatility, with some asset classes trading wildly from one day to the next. This has continued to challenge attempts to add value through asset allocation and security selection, as macro noise drowned out analysis of market fundamentals for many active managers. Developed international stocks and domestic small-cap stocks rebounded strongly from challenging first half results. Volatile interest rates and currencies continued to challenge investment managers in the bond markets as an increasing amount of international bonds traded into negative interest rate territory. Domestic Stocks: Stocks performed extremely well for the quarter, as the S&P 500 Index returned 3.85% for the quarter to reach a positive total return of 7.84% so far this year. The Dow Jones Industrial Average, S&P 500 Index, and NASDAQ Composite all set new record levels during the quarter. 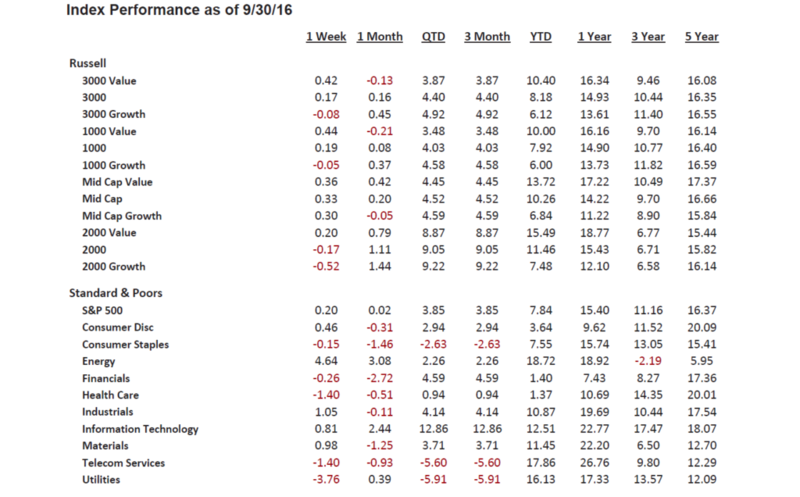 Value stocks continued their outperformance for the year, although growth stocks saw greater interest during the quarter across the market capitalization spectrum. Investor mentality seemed to shift gears following the first half of the year as the preference for more defensive, dividend focused stocks faded in the third quarter. Sector results witnessed a dramatic swing as the yield heavy Utilities and Telecommunication Services sectors that were the darlings during the first half of the year, saw the biggest declines this quarter. However each remains up over 16% year-to-date and still claim the top spots for performance overall along with Energy. Technology stocks ripped higher in the quarter gaining almost 13%. Financials also fared well, climbing 4.59%, despite the seemingly never-ending wait for Federal Reserve action on interest rates. Toward quarter’s end weakness in foreign banks stoked fears of the potential for another banking crisis (although this weighed on foreign shares to a greater extent). Energy stocks traded higher toward quarter end with some strength in oil prices on the back of an agreement within OPEC to curtail production. The price of West Texas Intermediate approached $50 as investors hoped any production cuts would help The earnings picture was less upbeat as corporate results failed to recover from negative growth trends. Nonetheless, investors looked past earnings challenges and market shocks as many economic reports continued to tilt to the positive, albeit ever so slightly. Analyst expectations for second quarter earnings started at over $28 on June 30, showing an 8% growth expectation for the quarter versus a year ago. Had this been realized it would have marked an end to the negative growth trend over the prior six quarters (since 4Q2014). However, once again, these earnings estimates were gradually reduced as company earnings were announced and the recent tally for S&P earnings landed at $25.70 (a decline of 9%) and pushing growth to negative 2%. This thereby marked the seventh consecutive quarter of negative growth in earnings. Additionally, revenue growth has been hard to come by and capital expenditures have been on the decline. With prices marching higher and earnings in decline, domestic stock market valuations have stretched in recent years. 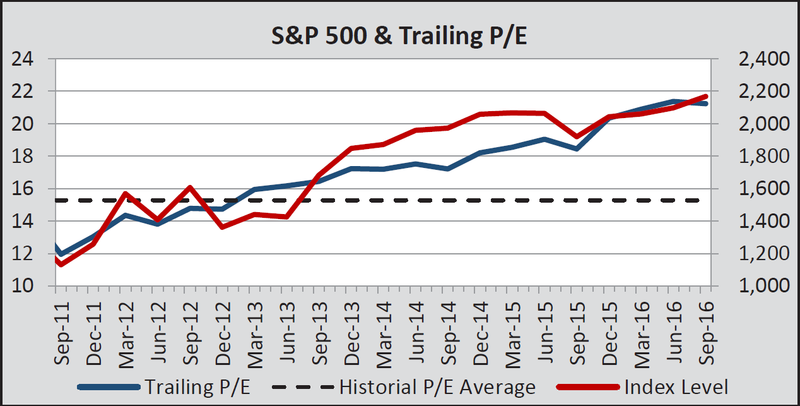 As of quarter end the trailing price-to-earnings ratio for the S&P 500 Index was over 21. This compares to a 10 year average near 17. Analysts remain ever faithful that future quarters will witness significant bumps up in earnings results (over 25% growth), putting the forward P/E ratio at 17. However, as discussed above, the tendency has been for earnings estimates to drift lower over time. Foreign Stocks: Developed countries outside the US also rallied (MSCI EAFE +6.43% and MSCI ACWI ex US +6.91%) but continue to trail US benchmarks for the year so far. The MSCI EAFE Index and MSCI ACWI ex US have returned 1.73% and 5.82%, respectively in 2016. These markets were quick to shrug off any concerns surrounding Britain exiting the European Union. Instead they seemed to grab hold of easy money policies and continued stimulus efforts from central bankers. The European equity market recovered 5.4% in the quarter to break even for 2016 so far. Japan’s continued efforts to stimulate its economy were met with investor optimism with the MSCI Japan Index climbing 8.6%. Emerging markets stocks saw some of the best performance in the quarter, with the MSCI Emerging Markets Index climbing over 9%. These markets benefited from brighter investment outlooks following the Federal Reserve’s hesitance to raise interest rates in the US, along with the perception that many commodities may have bottomed and could move higher if global growth picks up. China surged almost 14% in the quarter, overcoming prior concerns of the depth of its economic deceleration. Commodity-related emerging market economies like Brazil and Russia surged 11.31% and 8.43%, respectively. India also rose almost 6% in the quarter. 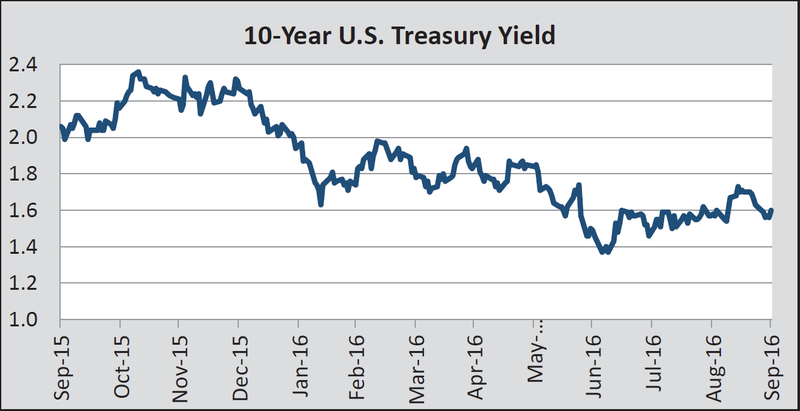 Bonds: The US 10-Year Treasury yield closed the quarter near 1.6%, barely budging from the prior quarter close. The bonds marked a low point of 1.37% on July 5 immediately following Brexit. The high of 1.73% occurred on September 13 as several Federal Reserve Governors had been discussing a greater likelihood of a rate increase at the September meeting than what the markets were expecting. Returns on domestic bonds in 2016 have been surprisingly strong as yields declined from the 2.27% level they traded at on December 31, 2015, despite the overwhelming belief that rates would edge higher over the course of this year. However, with yields more range bound in this quarter the Barclays U.S. Aggregate Index climbed only 0.46% with less impact of the tailwind of lower rates. In general, corporate credit and high yield bonds outperformed government issues. High yield bonds in the Barclays High Yield Index climbed over 5.5% and are up over 15% year-to-date. 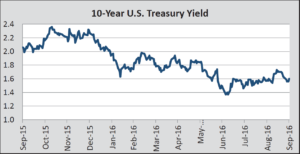 The decline in US Treasury rates remains at odds with Federal Reserve commentary and its repeated calls for higher rates. Persistent flare ups of global market uncertainty and anemic economic growth have kept Fed action on the sidelines. However, the Fed seems committed to raising rates at least once this year and a 25 basis point hike at the December meeting is largely expected. Despite their apparent zeal for yield, domestic investors have also shown a preference for the safety in US Government-backed debt. Foreign investors may have also bought in, preferring at least a marginal return on their bond investments compared to the negative rates available in many countries. The exact amount of foreign participation is difficult to gauge as rate spreads and currency fluctuations make capturing return differentials a more challenging endeavor. The stimulus efforts in Europe and Japan have fostered negative rates, and it is estimated that the amount of foreign bonds now trading with negative yields is nearing $15 trillion. At the end of the quarter similar 10-Year notes for Germany and Japan posted yields of negative 0.12% and negative 0.08%, respectively. The Barclays Global Aggregate ex U.S. moved higher, climbing 1.03% for the quarter as interest rate declines into negative territory boosted returns. Non-Traditional Investments: Commodity-related and real estate investments were mixed in the quarter, although many commodities moved higher off lows set earlier in the year. Nonetheless, the Bloomberg Commodity Index declined 3.86% in the quarter but is up 8.87% for the year so far. Oil markets were somewhat range bound, with WTI trading between $40 and $50. This provided MLP investors some relief and the Alerian MLP Index rose just over 1% for the quarter (up 15.94% YTD). Real estate investments took a breather this quarter with the FTSE NAREIT Equity REIT Index posting dropping 1.43% (up 11.75% YTD). 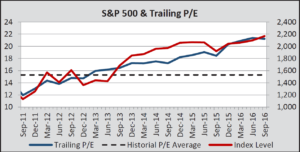 • In recent years, equity valuations have appreciated above longer-term average levels. • Corporate earnings growth has been depressed with lingering slow global economic growth. • US bond yields continue to trade near historic lows despite attempts by the Federal Reserve to talk rates higher. • Overseas, an increasing amount of foreign bonds are trading with negative yields. Additional risks to market sentiment could include the contentious and colorful US presidential election, along with the persistent threats from geopolitics, terrorism, and other “black swan” events.